Practice C Programming questions and answers for interviews, campus placements, online tests, aptitude tests, quizzes and competitive exams. This set of C Multiple Choice Questions & Answers (MCQs) focuses on “Inline”. Explanation: The inline function, whose definitions being small can be substituted at a place where its function call is made. They are inlined with their function calls. Explanation: The code shown above is an example of inline function. Both functions 1 and 2 are inline functions. Hence the output will be as shown in option (a). 4. What is the output of the code shown? Explanation: The definition of the function f1 is replaced with the function call. Since the format specifier used is %d, the ASCII value of the said character is printed. Hence the output of the code shown above is 97 (ASCII value of the alphabet ‘a’). 5. What is the output of the code shown below? Explanation: In the code shown above, the definition of function func1 is replaced with its function call. The function prints the alphabet at the second index of the given string. Hence the output of this code is ‘n’. Explanation: The above code will result in an error because we have used the keyword inline in the function call. Had the keyword inline been used in the function definition, the code would not have thrown an error. Explanation: The code shown a replaces the definition of a function max with it’s function call. This function is used to print the bigger of the two arguments. Hence -5 is printed. Explanation: In the code shown above, we have defined an identifier names inline using the macro #define. The output will be printed only if inline is defined. Since it is defined, ‘a’ is printed as output. 9. What is the output of the code shown below? Explanation: The above code will result in an error due to the statement: extern inline int min(int a, int b). The keyword ‘extern’ causes an error: undefined reference to min. Explanation: To have GCC inline the given function regardless of the level of optimization, we declare the function with the attribute always_inline. 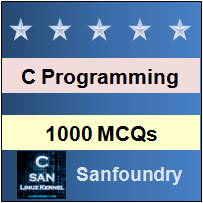 Sanfoundry Global Education & Learning Series – C Programming Language.